Last week I wrote about a client that “fired” their board of directors, and what they learned along the way and how they went about rebuilding a much stronger board. 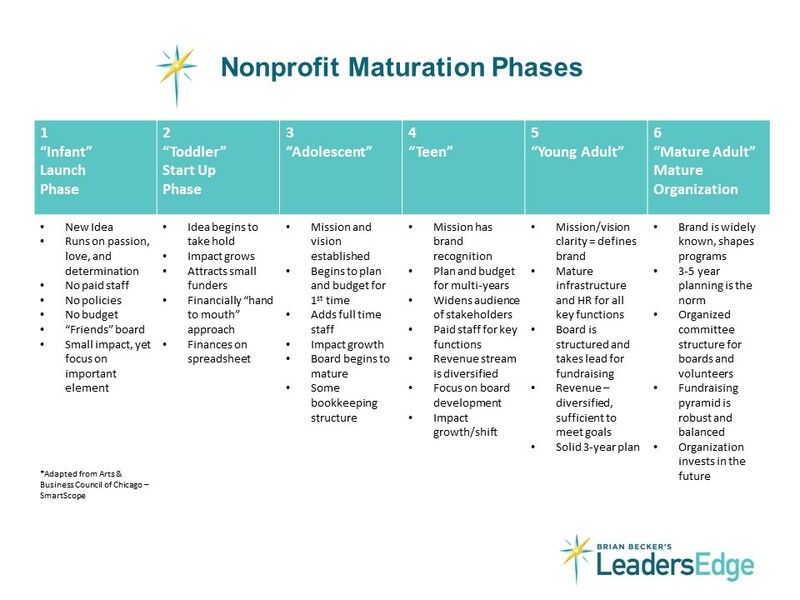 I included the graph showing a very astute “maturation process” for nonprofit boards. Much credit to the Arts and Business Council of Chicago for the original design of this. I’ve modified it a bit over the last year to fit my own client’s situation. In a recent interview, Bill Gates mentioned one of his favorite books Factfulness by Hans Rosling’s. He talked about the importance of building smart systems to solve big scale problems. This reminded me that the phrase I’ve often used, “It’s all about the leader” relating to whether organizations thrive or dive, while a clever turn of phrase…well, it’s just not that simple. This chart demonstrates how organizations can use a smart system to methodically strengthening their board of directors, which will, in turn, lead to an organization that is more sustainable, has a greater impact, greater scale, reputation and brand, etc. etc. Can you identify where your organization is on the chart? What needs to happen for your organization to move from one level to the next? This is the kind of work that I’m doing at Leaders Edge to help organizations rewrite their story endings so they’re more powerful, meaningful, and filled with hope. If you’d like to explore how your organization or department could start that journey, contact me. This blog shares perspectives on how you have the ability to create new story endings that are meaningful, powerful and filled with hope. I facilitate culture changing processes that help organizations achieve greater impact. Also, I provide leadership coaching to help executives and aspiring leaders become the fullest expression of who they’re intended to be.